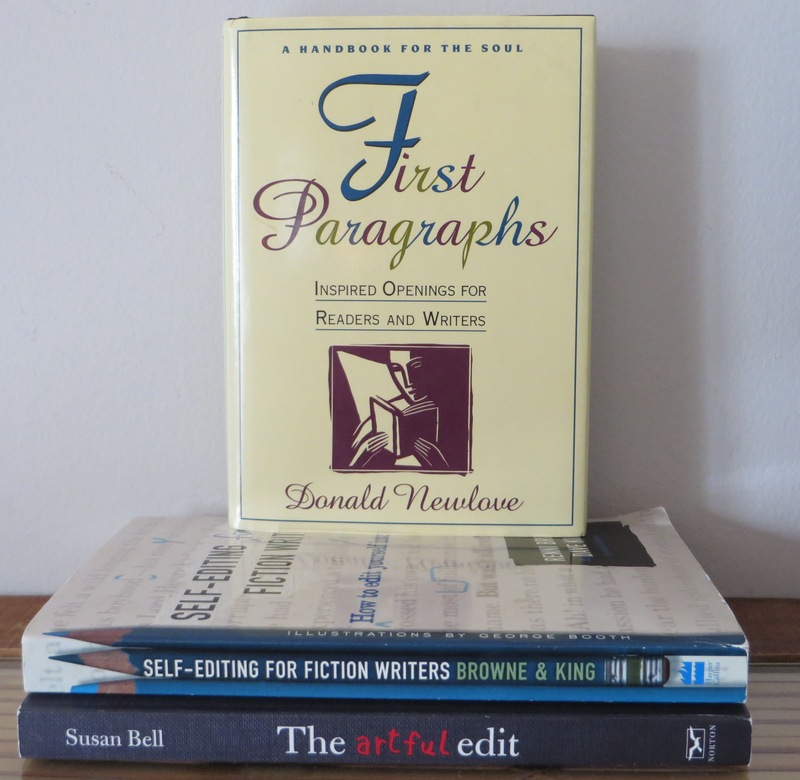 The following books on self-editing are two that I’ve added to my personal reference library on the subject of writing: Self-editing for fiction writers: how to edit yourself into print / Renni Browne and Dave King.–Second ed. and, The artful edit: on the practice of editing yourself / Susan Bell.–1st ed. 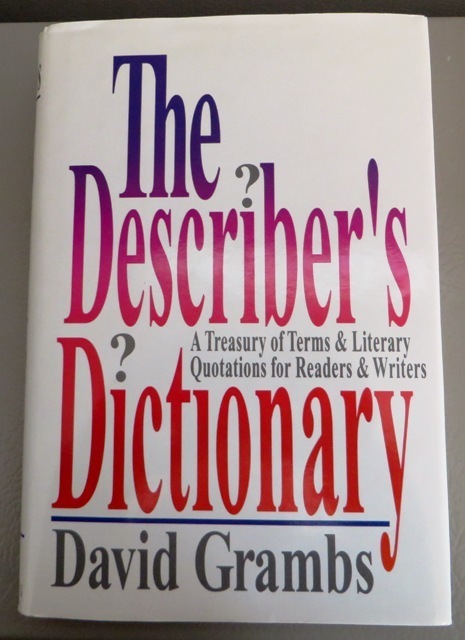 The first focuses “on the craft of editing”, and includes helpful checklists and exercises at the end of each chapter along with suggested answers to those exercises in an appendix; the second covers such topics as “gaining perspective”, “macro-editing” and “micro-editing” with references to F. Scott Fitzgerald’s correspondence with his editor Max Perkins during the writing of The Great Gatsby. Both of these volumes are worth rereading at least once a year. I would also add another one to my “worth rereading” category. Years ago I spotted it in a used bookshop/cafe where I stopped for a cup of tea, and would hate, now, for it to go missing. It’s entitled First Paragraphs: Inspired Openings for Readers and Writers and is written by Donald Newlove. It’s small enough to take with you to a doctor’s office to dip into while you wait for your name to be called, yet large enough in the scope of Newlove’s analyses that you can’t help but grow in your understanding of why some beginnings succeed and others do not. The Synonym Finder is a book that was originally edited by Jerome Irving Rodale, but was completely revised in 1978 by Laurence Urdang and Nancy LaRoche. No other thesaurus, including today’s online versions, has been anywhere near as useful to me. I’m sure, however, every writer has her/his own favourite source of synonyms. Check online to read current reviews of this book or to locate a more recent printing. This book’s subtitle is what really caught my attention in the first place, and I wasn’t disappointed when I began skimming the contents with no particular word search in mind. On the left hand side of facing pages you’ll find descriptive passages reprinted from the books of well-known fiction and non-fiction authors, “stellar literary examples of descriptive writing”–and on the opposite sides, a list of words gathered together within a subject category such as “shapes”, “light and colors”, “body types, frames, and statures”, “terrain and landscape”, “faces”, “voices” and oh, so many, many others! “The book uses a handy reverse, definition-to-term format that makes it easy for you to zero in on the term you are seeking.”–Inside flap of dust jacket. If you come across this dictionary in a store or library, take the time to browse a few of its pages. It makes for fascinating reading. I seldom indulge in purchasing a new book on the subject of writing, since many on my bookshelf are considered classics and are still relevant today–books such as Becoming a Writer by Dorothea Brande, On Becoming a Novelist by John Gardner, and One Writer’s Beginnings by Eudora Welty. Moreover, there are innumerable online resources for writers that supply answers to every conceivable question that one might have on this topic. The business of publishing in the 21st century has spawned sites, too, that discuss options available to would-be authors who may now consider the pros and cons of self-publishing (print-on-demand and electronic) as well as “hybrid publishing”, in addition to following the traditional route of approaching editors or literary agents. 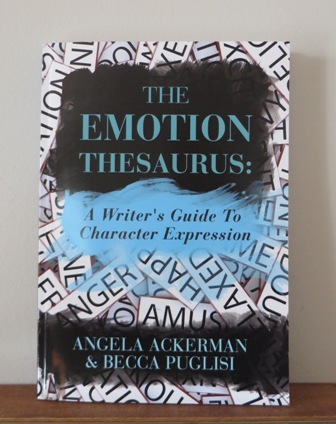 Yet once in a while, the title of a specialty book will attract my attention, and The Emotion Thesaurus: A Writer’s Guide to Character Expression by Angela Ackerman & Becca Puglisi is one of them. How often have you been in a writers’ group when someone has said, “show don’t tell”, or “your character needs to express more emotion”? For each of seventy-five core emotions, the authors have provided lists of descriptors that are specific to that state (i.e. agitation)–words or phrases involving physical signals (i.e. rubbing the back of the neck), internal sensations (i.e. short, fast breaths), mental responses (i.e. mentally ordering oneself to calm down, relax), cues of acute or long-term emotion (i.e. snapping at others), terms describing its “escalated” emotional response (i.e. anger) and cues of suppressed emotion (i.e. changing the subject). Each entry concludes with a useful “Writer’s Tip”. I highly recommend this book, which is available in both print and electronic editions. The authors host an online resource for writers–Writers Helping Writers (formerly The Bookshelf Muse)–and it’s well-worth a click on the following link for descriptions of their other thesauri: http://writershelpingwriters.net. Here are two more titles that I’m adding to this list of Print Resources for Writers, and I’ll explain why I consider them important enough to keep in my personal library. Readers and Writers Alike Should Enjoy This One! 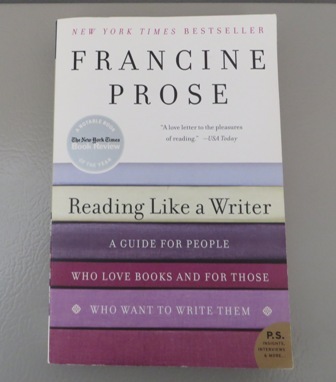 The first one is entitled Reading Like a Writer: A Guide for People Who Love Books and For Those Who Want to Write Them / by Francine Prose ; New York: Harper Perennial, c2006. The author goes beyond Newlove’s narrow focus of First Paragraphs (referenced in my February 17, 2013 entry above) to review all the other elements that make up the writing of good literature, such as word choice, individual sentence structure and content, dialogue and so forth. Like Newlove, Ms. Prose (what an appropriate name!) analyzes excerpts taken from classic and contemporary literature to demonstrate the authors’ techniques and probable reasoning behind their selection and arrangement of words. This is an inspiring book for writers and readers, as the title suggests, and one worth keeping on your bookshelf. 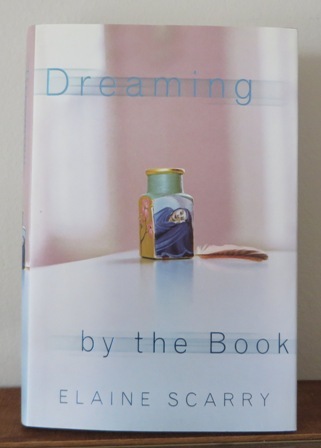 The second book I’m recommending today–Dreaming by the Book by Elaine Scarry (New York: Farrar, Straus and Giroux, c1999)–is one I read several months ago, after discovering it in the bargain bin of a bookstore. Although it’s tone is academic, I found it very readable, and I plan to hold on to it and ponder it’s contents again in the future. The two reader quotes on the back cover describe it far more ably than I would ever hope to. “Part reverie, part rhapsody, and lucid analysis throughout, Dreaming by the Book is living proof that one word is worth a thousand pictures…the images that words produce are endlessly in motion in our minds…”–Robert Fagles. “Brilliant may be too weak a word to describe Elaine Scarry’s groundbreaking new book. It is unique: it uses empirical findings from psychology and neuroscience in startlingly creative ways…This is the best example I’ve ever seen of cross-fertilization between science and literature; I finished Dreaming by the Book feeling that fundamental aspects of the nature of consciousness had been peeled open and exposed to view.”–Stephen M. Kosslyn. Again, as in Reading Like a Writer, the author closely analyzes excerpts from great literature to support her remarkable theories.